« Is ‘vegan’ a better term than ‘plant-based’ for an animal-free diet? It has outlined four areas for action: policy and legal framework; collaboration; education; and compliance and enforcement. Exemptions to the Prevention of Cruelty to Animals Act in favour of animal-based industries permit horrendous acts of cruelty to occur on a routine basis. The community should be informed of the reality through advertising, public relations and product labelling, to enable informed purchasing decisions. Neither issue has been addressed in the final plan, despite references to “care and respect” and “consumer confidence” (as referred in more detail below). The government still claims elsewhere, as it has for over three years, that the exemptions do not permit cruelty to occur. That is an outrageous claim, which shows no respect for animals or people seeking information on the issue. By their nature, the exemptions permit cruelty. Such government doublespeak is consistent with the failure to adequately address community education in the plan, with its intention (for example) to communicate “information about . . . good practice husbandry”, as referred to under the item “improve general animal welfare knowledge”. The focus is unashamedly welfare rather than rights. A welfare approach treats the question of rights as a one-way street by taking the position that humans have the right to exploit animals. It seems the plan has been created largely with the aim of ensuring that Victoria is well respected globally, with the related aim of protecting export markets. Most animals are clearly regarded by the government as products, with reference to “production animals” and “ethical and responsible animal production”. However, it is not in an animal’s interest to become someone else’s product. That means they are being exploited. It does not reflect “caring and respectful treatment”. With contradictions such as those, the “vision and purpose” statement does not represent a strong base on which to establish a plan for the benefit of animals. They are only some of the contradictions and inconsistencies within, or related to, the plan. The vision statement also refers to the need to avoid “unnecessary” harm. However, it is all unnecessary. For example, in respect of diet, both the American Dietetic Association and Australia’s National Health and Medical Research Council have written favourably about a vegan approach. I accept that economic issues need to be treated seriously by governments. However, animals should not be forced to pay the price for the well-being of the human population. The government is virtually admitting that “production animals” are regarded as economic cannon fodder, while pretending to be concerned about them. Other animals, such as those used in research, sport and entertainment, are suffering a similar fate, with financial motives again often playing a part. In her foreword, Jaala Pulford also states (with my underlines) that we all have a role to play in ensuring the welfare of pets, farm animals and wild animals. Similarly, the minister’s ambassador for animal welfare, Lizzie Blandthorn, states that we must protect animals from cruelty and support their quality of life, including on farms and in their natural environment. Those statements are from members of a government that (as indicated earlier) exempts many animal-based industries from the provisions of cruelty prevention legislation. They are from members of a government that permits the shooting of ducks, kangaroos and other wild animals as “recreation”. Allowing people to shoot animals “in their natural environment” is not my idea of protecting animals from cruelty. Many suffer horrendously before dying, and those left behind in their family and social groups are forced to fend for themselves, if they are able. Many victims of shooting are supposedly protected species. A grave concern in respect of kangaroos is that the prime targets of shooters are the largest, strongest individuals, with potentially critical impacts on the prospects of their mob (the term used to describe their group), along with the gene pool and the resilience of the species in increasingly challenging environmental conditions. The minister also claims that “animal welfare matters to all Victorians”. That is a massive generalisation in a state of over six million people. Much of the media reporting of the plan’s release focused on the intention to recognise animal sentience within legislation. However, that may be a form of tokenism, without meaningful benefits for animals. Do we really need science to tell us that? Any child who has interacted with an animal knows it. tail docking, ear notching, teeth clipping and castration, all without anaesthetic or subsequent pain relief. 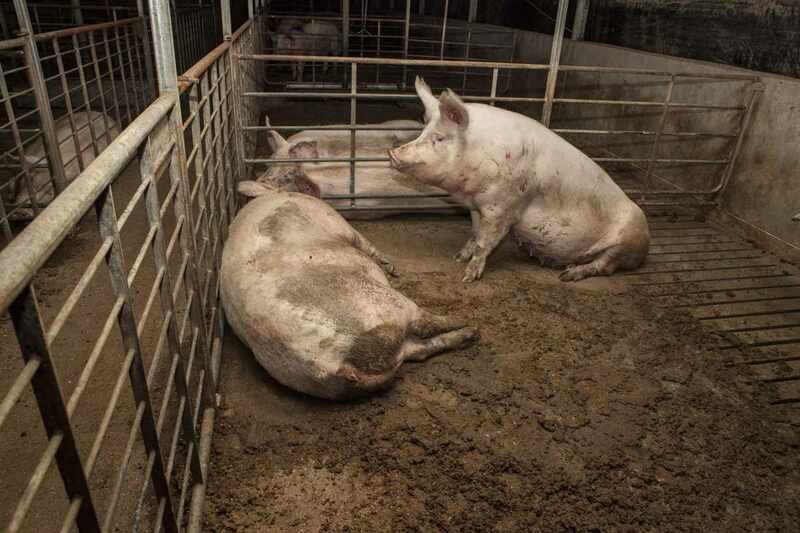 The Australian pig industry’s so-called voluntary ban on sow stalls allows them to be used for up to eleven days per pregnancy, and is not be binding on individual producers. In any event, the ability to monitor compliance is questionable, while the alternative of “group housing” is also inherently cruel. The industry has not indicated any action in respect of farrowing crates, which are even more restrictive than sow stalls. killing of “surplus” chicks (mainly male) in the egg industry through gassing with CO2 or by “quick maceration”, whereby they are sent along a conveyor belt to an industrial grinder while still alive. forced separation of cows and calves in the dairy industry within a day of birth to enable human access to the cow’s milk, with most male calves being sent to slaughter and many females retained for future production. forced breeding, often involving stimulation by humans, penetration with artificial devices, and ongoing confinement. 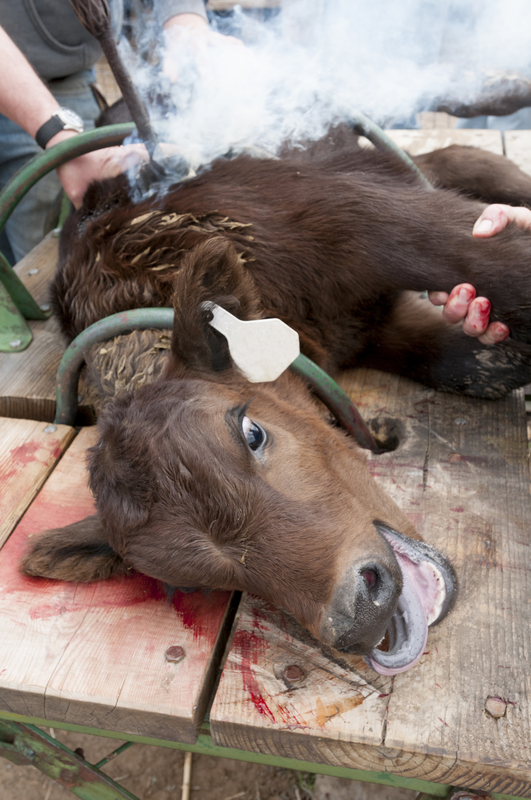 Here’s an image of a calf being branded with a hot iron, which I included in my submission responding to the draft plan. What appears to be the intended continuation of exemptions in respect of practices such as those described above is particularly damning when a stated outcome in relation to the legal framework is for the law to provide for “reasonable and considerate treatment of all animals, regardless of species, use or activity”. Does this mean that the relevant practices are considered “reasonable and considerate” for “production animals”, when many could result in jail terms if committed on companion animals? With the release of the new plan, the Victorian government has effectively abandoned animals and misled the community. The plan represents a classic and tragic example of government doublespeak and disregard for others. We and the animals deserve much better. For the purpose of the article, my usage of the word “animal” is based on the definition used in the plan, being “an animal covered by Victorian animal welfare legislation”. In nature, pigs are clean animals, and do not defecate where they eat and sleep. Wallowing in mud is an evolved behaviour, which they share with other animals, such as the hippopotamus. In a paper published in the journal Applied Animal Behaviour Science, researcher Marc Bracke from the Wageningen University and Research Centre reported that pigs and other wallowing animals did not develop functional sweat glands because wallowing was a part of their lifestyle. The mud now helps them to regulate their body temperature. Most pigs and other production animals lack the opportunity to undertake natural behaviours, with resultant detrimental impacts on their well-being. Many thanks for highlighting the ‘lies’ spread by government. My heart sinks at the thought of so much violence, that is not just ubiquitous, but so severe in intensity of suffering for the animal victims. Thank you for your resolute determination to promote animal rights, and to keep informing the public of this ‘inconvenient’ truth.